Canterbury is a cathedral and university city in Kent, in the South East of England. Canterbury Cathedral is the seat of the Archbishop of Canterbury, Primate of All England and hence the Primus inter pares of the primates of each national church in the Anglican Communion and spiritual leader and senior clergyman of the Church of England. Canterbury is a major tourist centre in the county of Kent. Even though it was bombed relentlessly during the Second World War (The Blitz), it still contains many ancient buildings, and modern building development within the medieval town centre is strictly regulated by officials at Canterbury. As a result of the murder of Thomas Becket in 1170, Canterbury became a major centre of pilgrimage, the backdrop of Geoffrey Chaucer's Canterbury Tales, written in 1387 about pilgrims passing the time by sharing stories. There is a museum in Canterbury about the Tales. Canterbury is easily accessible from London by following the M2 south and east until it merges with the A2, linking Canterbury with Chatham, Gillingham and Sittingbourne to the north, and the port of Dover to the south. Another regional arterial road, the A28, travels eastwards to Margate, Broadstairs and Ramsgate and westwards to Ashford, site of the Eurostar station for rail links to France, Belgium and the continent. Excellent park and ride facilities allow you to park inexpensively outside the city and take a bus into town. The parking fee is £3.50 per vehicle per day, or £1 if you arrive after 4PM, and entitles the driver and up to six car passengers to a round trip on the bus to and from the city centre. There are three park and ride sites: Wincheap (to the west of the city centre), New Dover Road (to the south) and Sturry Road (to the east). The buses stop at a number of intermediate stops between the park and ride car parks and the city centre. Park and ride buses run into the city centre every eight minutes between 7AM and 7:30PM Monday to Saturday. On Sundays, buses run every 15 minutes from New Dover Road and Sturry Road between 10AM and 6PM, but don't serve Wincheap at all. Old-fashioned signal box at Canterbury East. Canterbury is served by two railway stations: 51.2742441.0759281 Canterbury East and 51.2840641.0753812 Canterbury West. They are respectively 8 minute and 4 minute walks from the city centre by foot. Fare and timetable information is available from Southeastern, +44 8457 484950. The journey time to Canterbury West from London St Pancras is just under one hour, due to high-speed rail. Journey times from Ashford International (the closest Eurostar station to the Channel Tunnel) on this service are typically around 17 minutes. It is therefore possible to reach Canterbury from Calais in as little as 45 mins, from Lille in 1 hr 20 mins, from Brussels in around 1 hr 50 mins, and from Paris in around 2 hrs 20 mins. Alternatively, the service from London Victoria to Canterbury East is between 90 minutes and two hours. The advantage of this is that it's about £5 cheaper than the high-speed line, but arguably the price difference is not great enough to justify the much longer journey. The non-high-speed service goes via Tonbridge. At the weekend, non-high-speed services stop running at about 9PM: if you need to get back to western Kent, you may have to make a lengthy and expensive diversion via London. Coaches to Canterbury are available from London Victoria Coach Station and also from Dover. See this site for more details. Canterbury does not have its own airport. The nearest major international airports to Canterbury are London Gatwick (LGW IATA) about 66 mi (106 km) and London Heathrow (LHR IATA), about 96 mi (154 km). It is recommended to walk as the town centre is quite compact; it takes only 10 min to walk down the semi-pedestrianised high street. Cyclists are welcome in Canterbury; the first stage of the 2007 Tour de France finished in the city. However, dedicated cycle paths are relatively few. Local bike shop Downland Cycles (www.downlandcycles.co.uk) is located on the London-bound platform of Canterbury West train station. It offers bike rentals and sales. It also gives advice on how best to see the city by bike, having put together several good guides to local rides, including on road, off road, and dedicated path routes. Canterbury is well-served by buses which terminate at the main bus station at the end of the high street. Buses serve most destinations in East Kent. Stagecoach Coaches can be picked up from the bus station to Medway, London, Whitstable, Herne Bay, Greenhill, Swalecliffe and Chestfield, Margate and Sturry (these are all small towns close to Canterbury). Buses run regularly during the day however services are less frequent in the evenings. Bus timetables can be found on the Stagecoach Buses website. For hiring between midnight and 7AM, an additional 50% is levied. Canterbury has an interesting mix of architectural styles, from genuine Tudor buildings to 1960s style office buildings. However there are architectural gems around every corner. There is no coherent style to the buildings as much of the city was demolished during bombing raids in World War II, but much has survived. 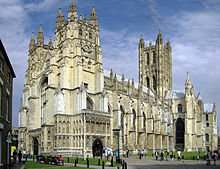 The Canterbury Cathedral, St Augustine's Abbey, and St Martin's Church are inscribed on the UNESCO World Heritage List. The subways on the east end of the main street have many paintings related to the Canterbury Tales. 51.27987051.08246451 Canterbury Cathedral, ☎ +44 1227 762862. Summer M-Sa 9AM-5:30PM, Su 12:30PM–2:30PM; Winter M-Sa 9AM-5PM, Su 12:30PM–2:30PM; last entry 1/2 hour before closing time. 11 The Precincts. The burial place of King Henry IV and Edward the Black Prince, but most famous as the scene of the murder of Thomas Becket in 1170. The mostly Gothic-style cathedral is the seat of the Archbishop of Canterbury, Chief Primate of the Church of England and spiritual leader of the Anglican Communion. £12.50. 51.27804171.09362244 St Martin's Church, North Holmes Road (10 min. walk, E from the centre, via Longport), ☎ +44 1227 768072, e-mail: visits@martinpaul.org. Tu Th 11AM-3PM, Sa 11AM-4PM (summer), Su 9:50AM-10:20AM. it is a part of the World Heritage site (Roman Shrine). It is the oldest parish church in England still in constant use. If you look at the flint walls, you can still see the red brick that was used by the Romans. Worth seeing. Free admission. 51.2781861.08798985 St Augustine's Abbey, Longport, CT1 1PF, ☎ +44 1227 767345. Nov-Mar Sa-Su 10AM-4PM; Apr-Sep Mo-Su 10AM-6PM; Oct Mo-Su 10AM-5PM. World Heritage remains preserved by English Heritage. adults £6.90, children £4.10, concessions £6.20. 51.27566241.07460026 Canterbury Castle. from morning until dusk. The ruins of a Norman castle built in the 11th century. Free admission. 51.27863561.08148019 Canterbury Roman Museum, Butchery Lane, ☎ +44 1227 785575. M-Sa 10AM-5PM (last admission 4PM), from June-end October, also open Su 1:30PM-5PM (last admission 4PM). A remarkable museum of Roman period Canterbury. admission adults £2.80, concessions £1.75, family £7.20 (2 adults and up to 3 children), groups of 10+ 10% discount, teachers free. 51.27963221.079240410 The Beaney House of Art & Knowledge (Canterbury Royal Museum and Art Gallery), ☎ +44 1227 452747. M-Su 10AM-5PM (closed Good Friday and Christmas week). With Buffs Regimental Museum, High Street. A splendid Victorian building housing decorative arts and picture collections, including a gallery for T.S. Cooper, England's finest cattle painter. The art gallery is the major space in the Canterbury area for the visual arts, with a wide-ranging annual program and exhibitions of both contemporary and historical work. The Buffs Museum - a branch of the National Army Museum in Chelsea, London - tells the story of one of England's oldest infantry regiments and its worldwide service. There is an extensive collection of medals with Victoria Crosses and other gallantry awards. Admission free. Canterbury Historic River Tours, Kings Bridge (in the centre of Canterburys main street, by The Old Weavers Restaurant), ☎ +44 7790534744. 10AM-5PM. Guided river tour providing a light hearted commentary discovering some of Canterbury’s finest architecture set against outstanding views of natural scenery. £5-11. Canterbury has many shops and stores, many of which are found in towns and cities across the UK. The Whitefriars development has brought many new outlets into Canterbury making it a great shopping destination. Shops in the city include Gap, Tescos, Top Man, Next and two independent department stores: Fenwicks and Nasons. There are also a plethora of smaller shops offering a unique experience. Canterbury city centre is a veritable trove of low to mid range restaurants and cafés. Many different styles of cuisine are available at prices to suit most pockets. Old Weavers Restaurant, 1 St Peters Street, ☎ +44 1227 464660. A small restaurant located in an area that is sometimes referred to as "Little Italy". The Old Weavers is delightfully situated by one of the spurs of the River Stour and has patio area seating. The menu concentrates on minor variants of traditional English and Italian food. Main courses start from £4.95. Goods Shed, Station Road West, ☎ +44 1227 459153. Housed in an airy converted engine shed, the adjoining farmers' market reassuring the visitor that the traditional cuisine will be of the best quality. Joint Winner of the Soil Association 2004 Award for Local Food Initiative of the Year . Typical meals are the roast organic chicken with sorrel, chard and potatoes, or the vegetable platter, with mushrooms, black lentils, chard, hard-boiled egg, swede, tomato relish and salad leaves. Home-made desserts available also. Mains £8-16. Thomas Becket, 21 Best Lane, ☎ +44 1227 464384. A small traditional pub in the city centre, offering excellent traditional British food. Be warned, they don't take credit/debit cards, only cash (Euros as well as Sterling) and cheques. Cafe Des Amis, 95 St Dunstan's Street, CT2 8AD (over the roundabout from the westgate towers), ☎ +44 1227 464390. A brilliant Mexican restaurant (with a French manager). A variety of fantastic tex mex meals and very good frozen cocktails. Meals are not too cheap (starting at £8.95 for one course (or ~£5.95 for breakfast/lunch), but are very much worth it. Most locals will agree this is one of the best restaurants in Canterbury £9+. Bangkok House, 13-15 Church St St. Pauls, CT1 1NH, ☎ +44 1227 471171. Good Thai fare, tasty, but fairly expensive! £11 for curry & rice. The Forge Bistro & Cafe, 61 Dover Street, CT1 3HD (Located just behind the Odeon Cinema), ☎ +44 1227 788022. Open From 10AM-10PM. The Forge is a delightful bistro specialising in European cuisine, serving nibbles, grazing platters and a blackboard lunch menu. All 2 person sharing platters are under £20. There are a large selection of pubs inside the city walls. Canterbury offers many chain pubs (such as JD Wetherspoons) but also many smaller venues. Due to the layout of the city, it is possible to walk down its numerous small streets and find a great place for a drink. Canterbury is also very close to Faversham, a town closely associated with Shepherd Neame brewery (Britain's oldest brewers) and has many pubs which offer many locally brewed real-ales. The New Inn, 19 Havelock Street. A small pub, in a converted terraced house, so there is a 'living room feel'. During term time, due to proximity of the Christ Church music department, it is frequented by many music students (and their lecturers). The Parrot, 1-9 Church Lane. Often has live jazz music and a cozy bohemian atmosphere. One of the oldest pubs in the country. Previously known as Simple Simons. Club Chemistry, 15 East Station Road. Canterbury's biggest nightclub, spanning three floors each with their own theme of music. Regular student night on Mondays. Saturdays are more of a locals' affair, higher prices reflect this. The Loft, 5-6 St. Margarets St. Serves good (but expensive) cocktails in a trendy environment. Attracts a young professional crowd. Westgate Inn, 1-3 North Lane. Large but not too noisy, well-suited for a casual drink and chat rather than partying. A Wetherspoon pub. The Canterbury Tales, 12 The Friars. Small pub opposite Canterbury's theatre (The Marlowe). The Canterbury Tales is tucked away down many of the city's streets and regularly has live music. Often full of theatre-goers. Caseys, 5 Butchery Lane.. A very small Irish pub down one of the small side-streets off the high street. The Cuban, 43 High Street. A South American-themed bar and restaurant conviniently located on the high street. Food is reasonably priced and a wide variety of drinks are available from the bar, including a good range of cocktails and bottled beers. Operates as a nightclub in the evening. Alberry's, St. Margarets St.. One of Canterbury's oldest and most established bars, located opposite The Loft. Food is served during the day. The Old Butter Market, Burgate.. A classic example of one of the many "traditional" pubs that Canterbury is famous for. Some good ales on tap along with the obligatory range of lagers. Prone to get very crowded. Bramley's, Orange Street. Next to the Orange Street music club, this bar is very popular but enforces a entrance policy to keep numbers down so it is reliably a quiet place to have a drink and a chat. The Cherry Tree, 10 White Horse Lane, Canterbury, CT1 2RU. A wild, packed pub, full of a mix of locals, students and weirdos. Always busy and spilling out onto the streets. Everyone is welcome. They have a selection of real ales, continental beers and local cider. Try a pint of the Biddenden's cider (or two if you dare/want to fall over!) The place is a dive, but the regulars and staff are friendly, and the drinks are all well kept. The Dolphin, 17 St. Radigunds Street, CT1 2AA, ☎ +44 1227 455963. A quiet pub, with a few real ales and a selection of fruit wines. Friendly staff and great pub food. Has a selection of games to play, and also a pub garden, which has draconian rules! Tiny Tim's Tearoom, St. Margaret's St (center of town), ☎ +44 1227 450793. Canterbury's finest and most traditional tea room serving authentic cream teas, afternoon teas, cakes, scones and lunches. Beer Cart Arms, Beer Cart Lane. Fairly large pub that caters the rock/metal community, but has a conventional mainstream DJ night Friday and Saturday nights, of which drinks are often more expensive. Mon-Thurs cheap drinks. First Tuesday of every month (not always the case), there is a rock/metal DJ night, and every Thursday they have gigs, representing rock and metal bands from all over Kent and the Southeast, many bands coming from London to play. Lady Luck, St Peters Street. M-Th 1PM-1AM; F Sa 1PM-2AM; Su 1PM-11PM. Rock pub, expensive, around £3 a pint of standard beer, but makes up for it with its atmosphere. Popular with students and locals alike, doesn't have a lot to cater for the more mainstream crowd though, busier at weekends. Has a wide range of lagers, and a few real ales and three ciders of differing strengths. Pool table and beer garden, the former reserved for the pool team on Wednesday evenings, and the latter usually closed early in Winter, so everyone has to smoke out front, after a certain time only plastic glasses allowed, and after midnight no drinks whatsoever. Art House Bed and Breakfast, 24 London Road, CT2 8LN (ten minute walk north of Westgate), ☎ +44 1227 453032, e-mail: annadofg@gmail.com. Converted fire-station just outside of the city. £55-60. Canterbury Cathedral Lodge, The Precincts, CT1 2EH (situated within the Canterbury Cathedral grounds), ☎ +44 1227 865350, e-mail: stay@canterburycathedrallodge.org. Views of the cathedral and a full included English breakfast. £70-129, includes admission to the cathedral. Ebury Hotel and Serviced Apartments, 65/67 New Dover Road, CT1 3DX (ten minute walk south of Canterbury), ☎ +44 1227 768433, e-mail: info@ebury-hotel.co.uk. Check-in: Midday, check-out: 11AM. Family owned hotel with indoor pool and serviced apartments, parking, gardens and restaurant. £85-150. Canterbury Youth Hostel, Ellerslie, 54 New Dover Road, CT1 3DT, ☎ +44 870 770 5744. 69 bed hostel about a mile from the city centre. £17.50 per Adult. Walk or cycle to Whitstable along the Crab and Winkle Way. The walk takes you up through the University and then along a disused railway track which was previously used to carry goods from Whitstable to the North into Canterbury. It is not for the fainthearted (being around 6 miles long) however after a stop in Whitstable it is possible to get a bus back to Canterbury (costing around £3). Crab and Winkle Way is also a cycle path. This city travel guide to Canterbury is a usable article. It has information on how to get there and on restaurants and hotels. An adventurous person could use this article, but please feel free to improve it by editing the page.